If what you want is to laugh and freak out with impossible mates and insane acrobatics, this 2019 you cannot miss the Harlem Globetrotters show! If what you want is to laugh, have fun, freak out with impossible mates and insane acrobatics, this 2019 you cannot miss the show of the wizards of basketball. The new tour of the Harlem Globetrotters begins in May 2019 and will be epic. The world-famous Harlem Globetrotters have left a real mark on their fans, both young and old, over the last 91 years, with their incredible family entertainment and unbelievable basketball skills. 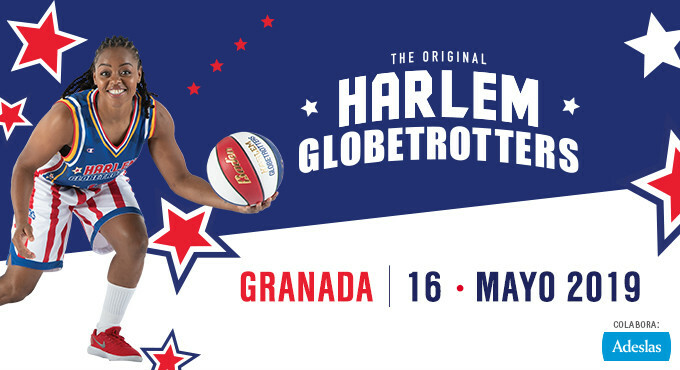 The authentic and incomparable Harlem Globetrotters are preparing for a tour that will arrive in Spain this 2019 full of action and news, special effects, as well as surprises for the spectators and with a list full of stars that will make the public be stuck to their seat throughout the show to witness the magic and art of the players with the ball. General Ticket (Prices 1, 2, 3 y 4): General access to the stadium to see the show. Corporate Ticket: Acceso a butacas premium, con espacio corporate reservado y zon de parking exclusiva en Centro Comercial Splau*. Entrada President Club - 5 estrelles: Acceso a butacas premium, con area club reservada y plaza de parking en el estadio con acceso directo**. Entrada Executive Club: Acceso a palcos privados premium, con zona privada exclusiva (salón privado con sofá, nevera y TV), servicio de catering incluido y plaza de parking en el estadio con acceso directo***. * Puedes acceder al parking reservado del CC Splau enseñando tu entrada CORPORATE. ** Puedes acceder al parking exclusivo del RCDE Stadium siguiendo las indicaciones y mostrando tu entrada PRESIDENT CLUB 5 ESTRELLAS o EXECUTIVE. *** La entradas Executive Club están localizadas en los palcos privados del estadio. Cada palco privado tiene vista privilegiada al terreno de juego además de su zona privada con sofá, TV y otros servicios. El servicio de catering está incluido en el precio de la entrada. GROUPS: Enjoy 20% discount when you buy 10 tickets or more. 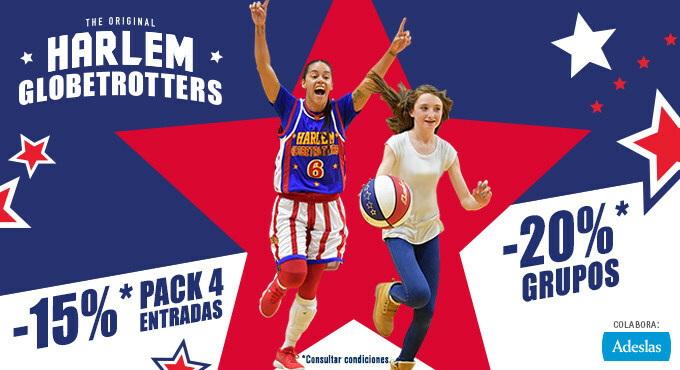 This discount is valid for all price zones except Globetrotters Experience, Floor Seats and Price 1. Contact us on (+34) 902 731 944 (Ext. 205) or email us at grupos@proactiv.es. 4-TICKET PACK: Enjoy 15% discount when you buy 4 tickets. This discount is valid for price zones 3 and 4. Discounts cannot be combined. Admin fees not included. Enjoy all the benefits of the Magic Pass before the show: A 30-minute experience with the players, where you can interact with them, learn some tricks and feel like part of the Globetrotters team! Meet the Globetrotters! You will have an exclusive, private Meet & Greet with the players, where you can talk to them, take selfies with them and get their autograph! Sit in the best seats! You will be sitting court-side, right next to the players' bench. You will feel like one of them! Take home an exclusive certificate from the show. The B floor seats are at the same level as the A floor seats. Babies born after January 1 2017 do not need to pay for a ticket but must not occupy a seat. This show does not have a checkroom or place to leave strollers. Reduced mobility: At all our shows, we have areas for people with reduced mobility. These areas have a different price (depending on the venue in each city) and can only be accessed by the person with reduced mobility and one companion. Meet & Greet - GLOBETROTTERS EXPERIENCE: Meet the players and take selfies with them! With these tickets, you can meet some of the Harlem Globetrotters exclusively and privately, talk to them, take selfies with them and take home some autographs and unforgettable memories! To enjoy this Meet & Greet with the players, you must be in your seat 45 minutes before the show starts. Representatives from the organization will come and find you. MAGIC PASS: Activities with the players for 30 minutes! You must buy the Magic Pass ticket to access this part (except those who have bought a Globetrotters Experience ticket). Children under 16 years may not enter the venue without a responsible adult. Accompanying adults must also buy a Magic Pass ticket. Minors aged between 16 and 18 years must present authorization signed by their parent or legal guardian to confirm that they may attend alone. MINORS: Children under 16 years may not enter the venue without a responsible adult. Minors aged between 16 and 18 years must present authorization signed by their parent or legal guardian to confirm that they may attend alone. Should attending minors not comply with the aforementioned requirements, the organization reserves the right to deny entry to the venue. You must have 3D Secure activated on your card to buy tickets on this site. For more information, contact your bank. Keep in mind that all ticket sales are final; there will be no refunds, seat changes or returns once the purchase process is complete. Discounts are applied to the price before you make your card payment. Please check the discount has been applied. It has been registered correctly.